A new business—insurance on business Web services—is proposed. As more and more Web services will be developed to fulfill the ever increasing needs of e-Business, the e-marketplace for Web services will soon be established. However, the qualities of these business Web services are unknown without real experiences and users can hardly make decisions on service selection. We propose that insurance can help build trust in the market of Web services. 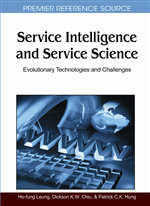 In this chapter, we propose three insurance models for business Web services and enabling technologies, including quality description, reputation scheme, transaction analysis, etc. We believe that the insurance of business Web services will help service competition and hence boost the development of more and more business Web services, and the software industry at large. Electronic Business, or e-Business, is the business that can be conducted via computers and software over information networks. It is a revolutionary business paradigm that has emerged with the advent of the Internet era. It is currently transforming the commercial world. E-Business features automatic information transfer on the Web and automatic information processing at the nodes of the Web, known as Web servers. Software applications are playing critical roles in automating these tasks. Currently, software applications on the Web can deliver a wide variety of solutions to address a wide variety of customer and business needs. Electronic purchase orders, payments, negotiations, collaborative work, stock trading, are just a few examples of these applications in e-Business. What a server can provide can be called services in general. Hence, traditionally, what a Web server can provide has also been called Web services. However, just in the recent several years, Web services have been mainly used to refer to those platform-neutral, self-describing software components that implement business functions and can be automatically discovered and engaged with other Web components to complete complex tasks over the Internet. In other words, Web services are just software components that are networked—instead of applications that are networked. The Web services approach can greatly simplify B2B collaboration and provides a new model for the way businesses share their data and systems. By packaging business processes as software components, Web services will drive much of the still-to-be-developed e-business landscape. Web services will be the main driver of e-business as more business processes are transformed into software elements. Most of such Web services that implement core functions of business will be delivered to customers with service charge and we refer to this kind of Web services as business Web services. Gartner says that the market of software as a service (SaaS) will reach $9.6 billion in 2009, a 21.9 percent increase from 2008 revenue of $6.6 billion, and will show consistent growth through 2013 when worldwide SaaS revenue will total $16 billion for the enterprise application markets. Therefore, in the remaining parts of this paper, we also mean “business Web services” when we talk about “Web services”, if it is not clearly specified. Many experts have highly evaluated the impact of Web services, which will fundamentally transform Web-based applications by enabling them to participate more broadly as an integrated component to an e-Business solution. As pointed out by Alexander Linden, research director for Gartner, Web services will facilitate much faster software development and integration, enable businesses to become more agile, and help them focus on their core competencies (Coursey, 2001). Gartner had predicted that software Web services will be the next big business IT trend, picking up speed soon. Several companies have already seen the potential commercial opportunities and have invested largely on the Web services infrastructures, which can facilitate the development, delivery, and integration of Web services. For instances, Microsoft has already released their Web service platform, known as Microsoft .NET (http://www.bluestone.com/products/hp_web_services/).